Doxorubicin HydrochlorideCAS No. 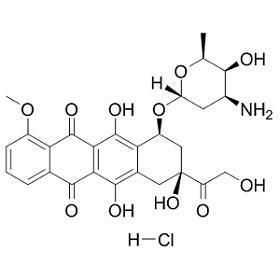 : 25316-40-9Formula: C₂₇H₃₀ClNO₁₁Molecular Weight: 579.98Biological Activity: Doxorubicin hydrochloride is a Topoisomerase II (Top2) catalytic inhibitor, also is a broad spectrum antibiotic used in the treatment of cancers, with IC50 of 374 nM for Hela cells. TemoporfinCAS No. 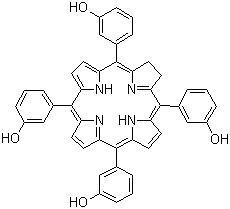 : 122341-38-2Formula: C44H32N4O4Molecular Weight: 680.75Biological Activity: Temoporfin is a synthetic light-activated chlorin with photodynamic activity. 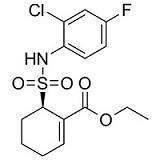 Upon systemic administration, temoporfin distributes throughout the body and is taken up by tumor cells. Upon stimulation of temoporfin by non-thermal laser light (at 652 nm), and in the presence of oxygen, this agent produces highly reactive short-lived singlet oxygen and other reactive oxygen radicals, resulting in local damage to tumor cells. This may kill tumor cells and may reduce the tumor size. Temoporfin(KW 2345) used in photodynamic therapy for the treatment of squamous cell carcinoma of the head and neck.Patients can remain photosensitive for several weeks after treatment. 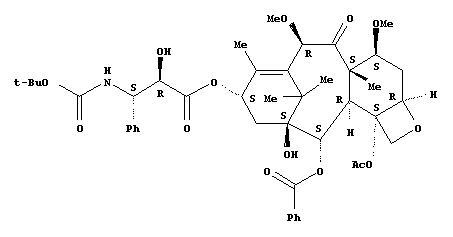 Belinostat (PXD101; PX105684)CAS: 866323-14-0Formula: C15H14N2O4SMolecular Weight: 318.35Biological Activity: Belinostat is a potent HDAC inhibitor with an IC50 of 27 nM in HeLa cell extracts. Cyclopamine(11-Deoxyjervie)CAS:4449-51-8 Formula: C₂₇H₄₁NO₂ Molecular Weight:411.62Biological Activity:Cyclopamine is a Hedgehog (Hh) pathway antagonist with IC50 of 46 nM in the Hh cell assay. TAK242; TAK 242;Resatorvid; 瑞沙托维; Resatorvid(TAK-242)CAS: 243984-11-4Formula: C15H17ClFNO4S Molecular Weight: 361.82Biological Activity: TAK-242 (resatorvid), a small-molecule inhibitor of Toll-like receptor (TLR) 4 signaling. TAK-242 is in treatment of sepsis and septic shock.TAK-242 (resatorvid), a small-molecule-specific inhibitor of Toll-like receptor (TLR) 4 signaling, inhibits the production of lipopolysaccharide-induced inflammatory mediators by binding to the intracellular domain of TLR4. Cabazitaxel(XRP-6258); 卡巴他赛CAS: 183133-96-2Formula: C45H57NO14 Molecular Weight: 835.93Biological Activity: Cabazitaxel is a semi-synthetic derivative of toxal, a natural taxoid microtubule inhibitor. Cabazitaxel has been shown to have antitumor activity in vitro, and while it has a lower affinity for the ATP-dependent efflux pump, P-glycoprotein 1 (P-gp) relative to toxal or docetaxel, it has shown greater ability to penetrate the blood-brain barrier than either. In mice and rat models, uptake of cabazitaxel has been shown to increase at concentrations above 11 μM and saturation has been seen at 13 μM. This seems to suggest that P-gp may be essential to transport cabazitaxel across the blood-brain barrier at specific threshold concentrations.